"Buying" the papacy. Giovanni paid his predecessor, Pope Benedict IX, what is sometimes considered a pension; when Benedict left, Giovanni was recognized as Pope Gregory VI by the cardinals. Gregory is also known for being one of the few popes in history to resign. 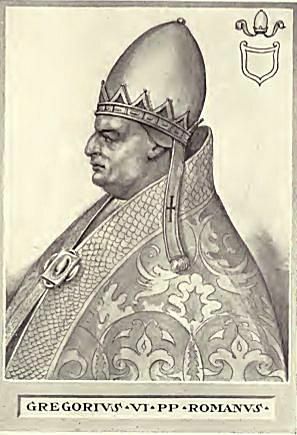 When Giovanni Graziano paid his godson a pension to convince him to resign, most scholars agree he did so out of an honest desire to rid the papacy of the dissolute Pope Benedict IX. Unfortunately, as Pope Gregory VI, he achieved little in Rome before Benedict and the antipope Sylvester III returned. The chaos that resulted as each man represented himself as the true pope was too much, and King Henry III of Germany rode south to settle the matter. At a council at Sutri, Italy, Benedict and Sylvester were deposed, and Gregory was convinced to resign the office because his payment to Benedict could be viewed as simony. He left Italy for Germany, where he died not long after. For more about the life and pontificate of Gregory VI, see his Concise Biography. Concise look at Gregory by Horace Mann. Who Was Pope Urban II?